Wherever there are people, there are pets. We are a species that attracts, and is attracted to, animals whose own species have evolved through adapting to human interaction. Even when certain dogs and cats and other companion animals are not socialized to humans, their overall species has adapted to us, and therefore, they rely on us for their survival. That is why there are growing efforts to address the needs of homeless pets who live off the discards of humanity and lurk on the fringes of our lives. Humanity created their situation. They did not. It amazes me to see people working to resolve the problem of homeless pets in their local communities. When someone travels to another side of the world to do it, well, that is just incredible. Not only did she do that, she walked away from a thriving career in Atlanta, GA and started the charity Amazon Community Animal Rescue, Education and Safety (Amazon CARES) in the Peruvian Amazon. On her first trip to the region, she was struck by the awareness that numerous worldwide organizations were working on environmental issues affecting the Amazon, but there was no effort to address the needs of homeless domestic animals. “One could not walk three feet without stepping over a severely ill dog, lacking hope or opportunity in this environment,” she said. The experience compelled her to act. Amazon CARES has since received international acclaim for its innovation and essential work to aid sick and injured animals, promote spay-neuter programs, and reduce the abuse and neglect of companion animals. Their programs aim to improve community health through working with both the animals and human beings in the region. It is a daunting task. The concept of animal welfare is not as established in this society as it is in American culture, thus educating citizens about the importance of animal care is a big job. The volunteers of Amazon CARES have made considerable progress in a few short years. Recently, though, they have faced serious setbacks. The Peruvian Amazon region has been experiencing the worst flooding in decades. The shelter in which they had housed sick animals and tended to their veterinary needs was washed away in the floods. The animals were rescued, but they are now in cramped quarters. The Fondation 30 millions d’Amis has provided them with an emergency grant, and they have received generous donations from private donors. This has enabled them to build a smaller, emergency shelter on higher land. Local government is donating wood to assist with the project. More donations are needed, though. You can learn more here, and you can contribute to the fund raising campaign with the widget below. 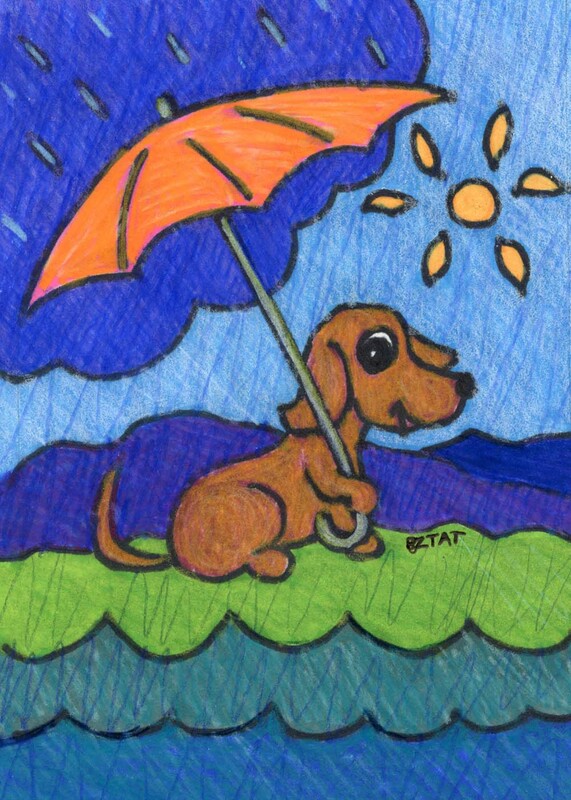 The picture above is one that I drew to encourage hope amidst the losses facing Amazon CARES. Indeed, hope is what they are all about. Their work is so inspiring. I wish them well as they work to recover from the setbacks and continue the marvelous work they do – for the animals and for the people of Peru.